At left, sanitation worker Elmore Nickleberry sits in a room in his in Memphis, Tenn., home that displays items commemorating the civil rights movement. 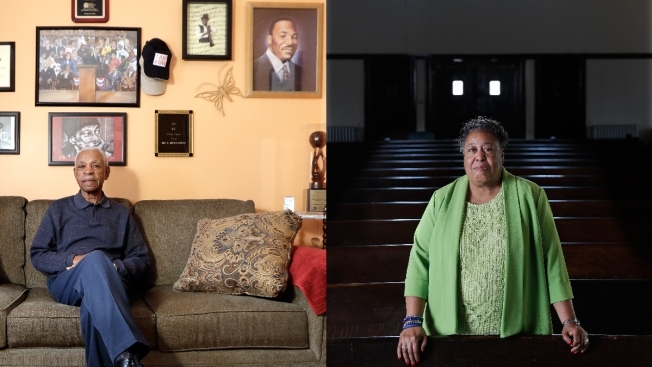 At right, Clara Ester stands in the Centenary United Methodist Church in Memphis. Both were supporting a sanitation workers' strike that brought Rev. Martin Luther King Jr. to the city when he was assassinated on April 4, 1968. Clara Ester's eyes were fixed on the Rev. Martin Luther King Jr. as he stood on the concrete balcony of the Lorraine Motel. King was in Memphis to support a sanitation workers' strike, and Ester, a college student, had been marching alongside the strikers as they sought better pay and working conditions. She and some friends had gone to the motel for a catfish dinner when she saw King chatting happily, not far from where she stood. Then Ester heard the shot. 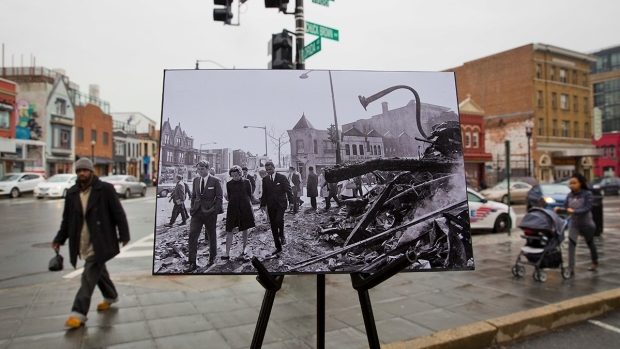 It was 6:01 p.m. on April 4, 1968. "I'm still looking at him," Ester recalled. "He looked like he was lifted up and thrown back on the pavement. Next thing I remember, I was stepping over his body, and I'm noticing that he's struggling for air." King's death changed the world and altered the lives of those who lived through it. Some would spend the rest of their lives fighting for racial equality and economic justice. Others, including Ester, would struggle to come to terms with what they saw. King had won victories on desegregation and voting rights and had been planning his Poor People's Campaign when he turned his attention to Memphis, the gritty city by the Mississippi River. On Feb. 1, 1968, two sanitation workers were crushed when a garbage truck compactor malfunctioned, sparking a strike by about 1,300 black sanitation workers weary of horrible working conditions and racist treatment in the dirtiest of municipal jobs. The words that would come to signify their protest — "I Am a Man" — were not a given with everyone in Memphis at that time. "We didn't have a place to shower, wash our hands, nothing," said Elmore Nickleberry, who at 86 still drives a truck for the department. King tried to lead a peaceful march on March 28, but it turned violent. Storefront windows were smashed, and police wielded clubs and tear gas. 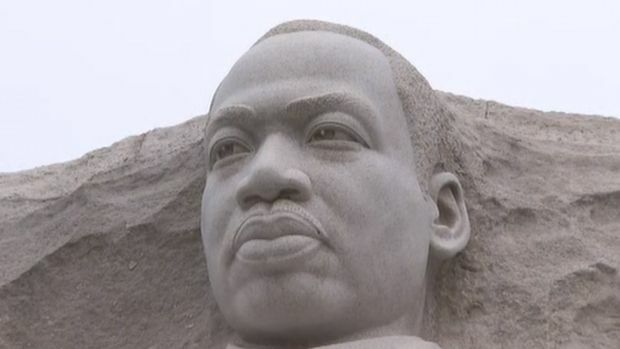 A Message of equality and unity echoed across the country Monday, a day set aside to honor and remember civil rights hero Dr. Martin Luther King, Jr.
King went back to Atlanta but vowed to return to show that non-violent protest still worked. Criticism mounted in the press. He was suffering headaches and feeling depressed. He met with his advisers, the Rev. Jesse Jackson said, and "talked himself out of the depression." He flew back to Memphis on the morning of April 3. Mike Cody was among the lawyers working to persuade a judge to lift an injunction against a new march who met with King in his motel room. "King felt strongly that unless he could get a success here in Memphis, with these workers using nonviolent, civil disobedience, then he would never get the Poor People's March in Washington that summer," said Cody, 82. Cody was in the crowd later that evening at the Mason Temple. Though King was ill, the Rev. Ralph Abernathy asked him to address the thousands who turned out despite a thunderstorm. "It's a tin roof, so that's banging. There's rafters up there above us, and the rafters are blowing with the wind and hitting each other and hitting the walls from the fierceness of the wind and the rain," said the Rev. James Lawson, a prominent civil rights activist. With little preparation, King delivered a speech that, in retrospect, seemed to foretell his death: "Well, I don't know what will happen now; we've got some difficult days ahead. 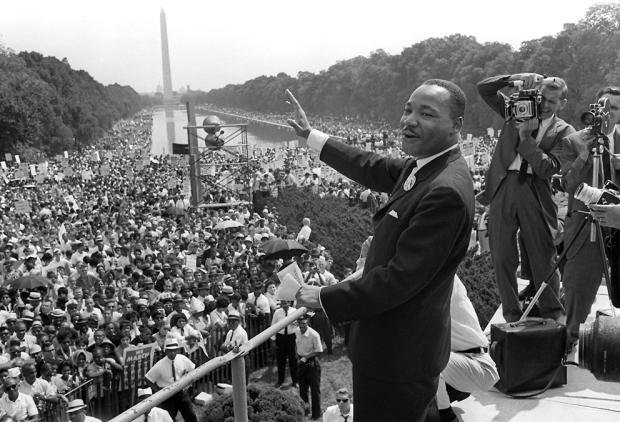 But it really doesn't matter to me now, because I've been to the mountaintop." When he finished, King slumped into a chair. He looked to Cody like a "toy that had the air taken out of it." "Ministers, men were crying," Jackson said. Cody went to court the next day with King aide Andrew Young, then dropped Young back at the Lorraine Motel in the late afternoon. King had spent most of the day in meetings. He asked Young where he'd been and then threw a pillow at him. "Then everybody picked up pillows and beat me up," Young said. "All of us were in our 30s, and we were acting like 10-, 12-year-olds. But it was the happiest I had seen him in a long time." As dinner approached, King and his friends moved to the motel balcony. King turned to a bandleader who was standing nearby and made a request: Later, could he play his favorite song, "Take My Hand, Precious Lord"? Newly released reel-to-reel tapes from Tuskegee University Libraries includes speeches by Dr. Martin Luther King Jr. at a Tuskegee Civic Association meeting in July of 1957. 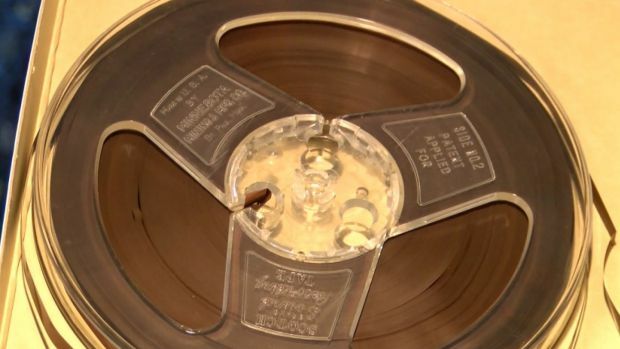 The collection includes a number of recordings dating back to the 1950s that were transferred from two sides of a 7-inch reel-to-reel tape preserved in the Tuskegee University Archives' TCA audio collection. "It is for the whole world," said Tuskegee archivist Dana Chandler. "We want people to hear it, and comment on it, and write their papers on it, and publish their articles on it in books." Then: "Pow! A bullet," recalled Jackson, pointing to the right side of his own face. "At first I thought it was a firecracker or car backfiring," Young said. Jackson ran toward the balcony steps. "Someone said, 'Doc has been shot,' and 'Get low,'" Jackson said. Earl Caldwell, a New York Times reporter who had interviewed King on the balcony the previous day, ran out of his motel room in his boxer shorts. "I was thinking, 'It was a bomb. It was a bomb.' Because the noise was greater than a gun," he said. A photo shows Jackson, Young and others pointing across the street, where the shot came from. "I remember Rev. Abernathy saying, 'Back up, back up, this is my dearest friend. Martin you can't give up, don't leave us,'" Jackson said. Ester said she noticed King's tie had been blown off. His eyes were open "with almost a pleasant expression on his face," she said. Sirens blared. People screamed. Police rushed to the motel. King was rushed to St. Joseph's Hospital, where college student John Billings worked as a surgical assistant on the night shift. "Three doctors came over and walked to where I was standing. They said, 'OK Billings, go find somebody in charge and tell them that Dr. King has expired,'" he said. Billings was then ordered to stay with King's body until someone could come get him. Months before the Rev. 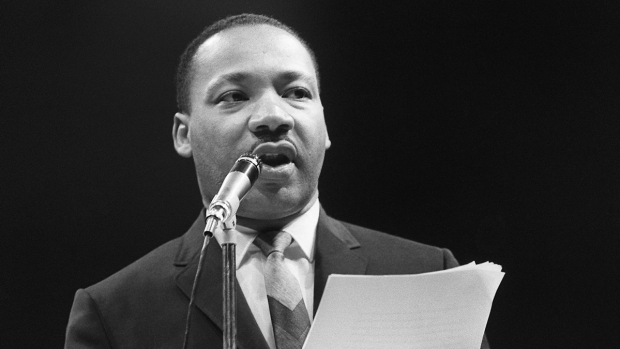 Martin Luther King Jr. delivered his famous “I Have a Dream” speech to hundreds of thousands gathered in Washington in 1963, he fine-tuned his civil rights message before a much smaller audience at a school gymnasium in North Carolina. "I walked over, pulled the sheet back, and there he was," Billings said. "His eyes were closed. I thought, 'How strange this is.'" Security was heavy when Dr. Jerry Francisco, the Shelby County medical examiner, arrived. Men holding shotguns stood inside and outside the room. After the 1½ hour autopsy, Francisco drove home through a city that had been placed under curfew, for fear of rioting. "The streets were just virtually empty. I was the only car moving on the street," he said. It was eerie, he recalled. Coby Smith, a leader of the Invaders organization, which had a militant reputation, vividly remembers the aftermath, when tanks rolled into neighborhoods, the National Guard was called in, and police began arresting blacks in the streets. "(Police) had put tape over their badges," Smith said. "This was like a war." Fifty years after King's assassination, Ester has trouble talking about the months that followed. Haunted by her memories, she left her hometown. Billings, who is white, came to a new understanding of the struggle Southern blacks faced. He became a private investigator, met James Earl Ray, who pleaded guilty to killing King, and explored the notion that someone else had been involved. Young became a congressman, ambassador to the United Nations and Atlanta's mayor. Jackson ran for president twice, then stood in Grant Park in Chicago with tears streaming down his face after a black man was elected president in 2008. Cody continued working in civil rights law in Memphis, eventually serving as a U.S. Attorney and Tennessee attorney general. If King were alive today, "he'd be in people's face" about issues relating to race, poverty and inequality, Cody says. "We're not past all of that history." Associated Press staffers Rhonda Shafner, Robert Ray and Krysta Fauria contributed to this report.